The beach and pool aren’t the only ways to cool off during the hot summer months. Every summer movie theaters are packed with crowds looking to beat the heat and see some of the most exciting movies Hollywood has to offer. We asked members of the Omni Financial team what they thought were some of the best summer movies ever. 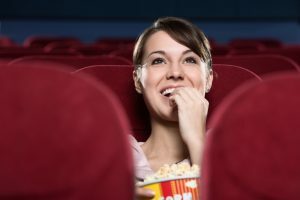 Grab your popcorn and see what’s on their favorite summer movie list (in reverse order of popularity). Some of Marvel Comics’ mightiest heroes – Iron Man, the Incredible Hulk, Thor, Captain America, Hawkeye, and Black Widow — fight the enemy in an attempt to save the planet in “Marvel’s The Avengers.” A summer 2012 blockbuster, this superhero movie performed some superhero powers at the box office setting numerous records, including being the fastest film to earn $1 billion. Tom Cruise flew into superstardom playing Maverick Mitchell, a reckless Navy fighter pilot, in the action drama film, “Top Gun.” Moviegoers fell in love with this story about the struggles of Maverick, as well as with his romance with Charlotte “Charlie” Blackwood, a civilian instructor. “Top Gun” became the highest grossing movie of 1986 and its soundtrack was also a hit, staying on the Billboard Hot 200 albums chart for five nonconsecutive weeks. The highest grossing film of 1985, “Back to Future,” stars Michael J. Fox as a teenager who goes back 30 years to 1955 in a time-traveling DeLorean created by his mad scientist friend played by Christopher Lloyd. The comedy-adventure movie produced a successful franchise including the movies “Back to the Future Part II” in 1989 and “Back to the Future Part III” in 1990, as well as an animated television series and a ride at Universal Studios Theme Park in California. Released on July 3, it’s hard to imagine that this movie about an alien invasion of Earth that takes place on July 4 wouldn’t be a hit. Directed by Roland Emmerich and starring Will Smith, “Independence Day” is a sci-fi film that has all the big-name talent, action, adventure, and special effects one would expect from a summer blockbuster. Scary, suspenseful, and grotesque at times, “Alien” has lots of elements that make it worthy of best summer movie status. A deadly bioform – the alien – invades a space ship and attacks crew members. One of the film’s most memorable scenes is when the monster/creature bursts out of the chest of one of the crew members. A little alien and a 10-year old boy form a special connection in this Steven Spielberg-directed movie. A favorite among families and film critics in the summer of 1982, “E.T. The Extra-Terrestrial” grossed more money at the box office than “Star Wars.” The movie, which was also known for its product placement of Reese’s Pieces, continues to pull at the heartstrings. Dinosaurs come back to life in “Jurassic Park,” a sci-fi/adventure based on the book by Michael Crichton. Audiences and film critics alike were awed by the incredible special effects and amazingly lifelike dinosaurs that were created using animatronics and CGI. “Jurassic Park,” directed by Steven Spielberg, showed the possibilities of what could be done with visual effects and the film’s popularity endures today. A long time ago…in the summer of 1977…a sci-fi movie called “Star Wars” took over the theaters with its space-age suspense and some of the most incredible special effects of its time. Written and directed by George Lucas, “Star Wars” brought moviegoers on an epic other-galaxy adventure that spawned one of the most popular film series and media franchises of all time. What do you get when you combine an idyllic beach, carefree swimmers, and a terrorizing killer shark? “Jaws,” of course, an iconic summer blockbuster that set the standard for all the summer movies that followed it. Directed by Steven Spielberg and starring Richard Dreyfuss and Roy Scheider, the thriller was so successful in inciting fear that reports say people were actually avoiding beaches that summer.